Boom Burger is a restaurant on the North River Causeway. I ordered the burger and proceeded to sit down and wait for my number to be called. There was a good amount of customers at this establishment for the time of day and I thought I might be waiting for a while. Walking to my seat I noticed everything not being used was clean. I then got up and headed to the washrooms to wash my hands before eating. The washrooms at Boom Burger are always clean, nothing ever seems out of place. After washing my hands, I went back to my seat and noticed even it was cleaned up! My ketchup and napkins were gone and so wasn't my straw. I went and got another one. A short time later, they called out my number and I proceeded to pick up my burger at the counter. Each of Boom Burgers burgers are wrapped up in tin foil to keep them warm, this really hurts them in terms of appearance, but at the same time, it does keep them warm if you are traveling. The first bite into the KaBoom reminded me of that they have a really good tasting burger. The next few bites started to bring out the downside of the burger, which was it was rather very greasy compared to the others. 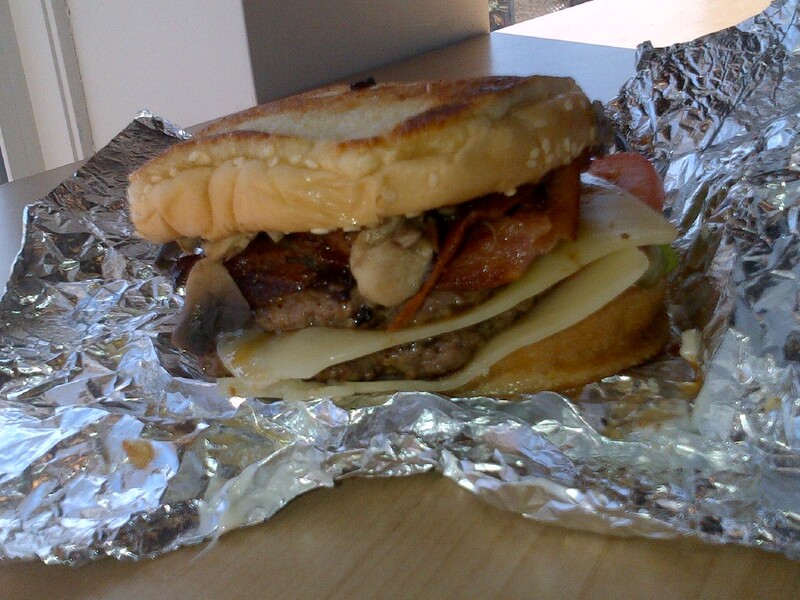 The grilled mushrooms had a good watery meaty taste to them and the two pieces of cheese were very enjoyable. After finishing up my burger, I left KaBoomed. All in all, I thought the burger was normal in the sense that everything on it was the normal stuff from Boom Burger. The customer service was also just normal. Nothing extra special, but nothing bad either. The total bill was around $12 which included the unlimited refills of pop. While I didn't feel the food coma, like I did with other restaurants, I did feel pretty greased up for the afternoon and boy was I glad I went to dodgeball for two hours that night! Overall, I would give BoomBurger's KaBoom 6.5 bites out of 10.